RMSA Assam Recruitment 2018 – Vocational Teacher Job vacancy (IT /ITeS) :- Rashtriya Madhyamik Siksha Abhijan (RMSA), Assam has recently published a recruitment notification in the month of July 2018. According top the latest RMSA Recruitment 2018 advertisement , eligible candidates may appear for an interview to be conducted for the position of “Vocational Teacher (IT)” under NSQF National Skill Qualification Framework, Assam. The interview will consist of written test on conceptual contents, Group Discussion, Computer proficiency test and personal interview. 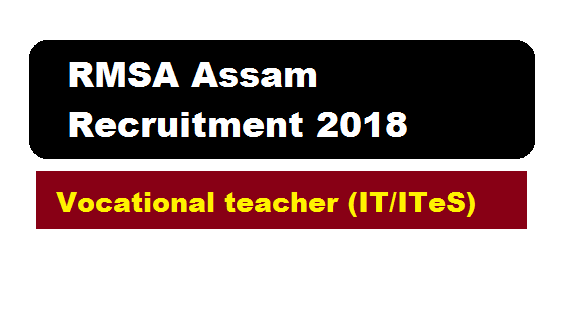 In this section, we will discuss in detail about Recruitment of Vocational Teacher Post in IT/ITeS under RMSA Assam Recruitment 2018 with all the details and requirement. Educational Qualification: Candidates should get 55% in BCA/B.Sc. (Computer Science/B.Sc. (IT) from recognized University OR 3 yrs Diploma in Computer Science/Engineering or IT/ITeS OR DOEACC A level(With 55% marks). Eligible and interested candidates may appear walk in interview with all all original testimonials. Note that the interview will consist of written test on conceptual contents, Group discussion , Computer Proficiency test and personal interview.